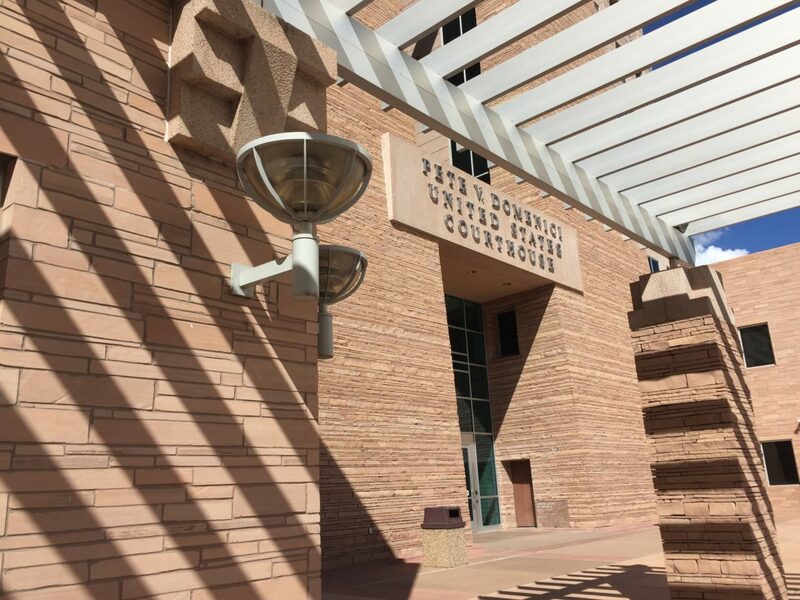 A new federal court filing indicates the practice of secrecy at New Mexico federal courts expands beyond the improper sealing of documents to improperly closing off court proceedings from the public. Assistant Federal Public Defenders John Robbenhaar and Aric Elsenheimer filed a document last week alleging that an Aug. 3 court hearing was sealed — meaning no one besides parties to the case could enter during the proceeding — without their knowledge. A transcript of the hearing also was sealed without their input, the filing says. On Sept. 4, New Mexico In Depth published a story showing that prosecutors and defense lawyers have been choosing which documents to file “under seal” — meaning the public cannot see them — even though judges are supposed to make those decisions, according to the court’s own rules. The case at issue involves two black men, Lonnie Jackson and Diamond Coleman, who were arrested in 2016 as part of a large-scale undercover sting operation carried out in Albuquerque by the federal Bureau of Alcohol, Tobacco, Firearms and Explosives (ATF). Chief U.S. District Judge William P. “Chip” Johnson, who oversaw the Aug. 3 hearing, inherited the case from former chief judge and now-Senior U.S. District Judge Christina Armijo. Earlier this year, Jackson and Coleman asked Armijo to order federal prosecutors to turn over a trove of documents. Armijo granted the request, saying the two men would have no chance to prove their racial profiling claims without the records, but Johnson has appeared more skeptical of the men’s allegations. He invited federal prosecutors to ask him to reconsider Armijo’s order. The Aug. 3 hearing was set to let prosecutors and defense lawyers argue their cases for whether the government should turn over the records. Unknown to the public defenders, the hearing itself was held in secret, the filing says — something they did not know until Sept. 11, when the public defenders received a transcript of the hearing. It was marked, “sealed proceeding,” according to the new filing from Robbenhaar and Elsenheimer. “None of the representatives of the Federal Public Defender present at the hearing … recall any discussion of sealing the hearing, either on or off the record,” they wrote. The lawyers also wrote one of their supervisors had attempted to enter the courtroom during the hearing and was denied by court security. It is not clear, the public defenders wrote, whether Johnson decided to seal the hearing on his own, or whether prosecutors were involved in or aware of the decision. Either way, they say the move violates Jackson’s and Coleman’s Sixth Amendment right to a public trial. Johnson has sustained the written objection, court records show, and ordered that the transcript be unsealed. A barrier remains, however: Journalists or others who want a copy of the transcript before Dec. 12 would have to pay more than $100 for it. And it appears the secrecy surrounding the case will continue. According to published clerk’s minutes from a status conference in the Jackson/Coleman matter on Tuesday, Johnson indicated that he would rule on prosecutors’ motion to reconsider Armijo’s order by the end of the week. He plans to issue that ruling under seal. Over the last 18 months NMID has closely examined the ATF sting operation, its design, its impact and the legal wrangling that continues to play out in federal court in more than two dozen stories. Of the 103 people arrested 28 — 27 percent of the total — were black.